The United States and the Taliban may have agreed on a plan for American troops to leave Afghanistan, sources privy to the development told VOA Saturday. In return, the insurgent group has given assurances that no international terrorist groups would be allowed to use Afghan soil to threaten America or any other country in the future. The sources told VOA they expected the two negotiating sides to announce the withdrawal plan by Monday at the latest, if all goes as planned. The U.S. drawdown plan would require the Taliban to observe a cease-fire. Both the withdrawal and the cease-fire, however, will be "limited and conditional." "We have a number of issues left to work out. Nothing is agreed until everything is agreed, and 'everything' must include an intra-Afghan dialogue and comprehensive cease-fire," he said. 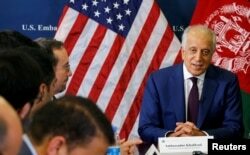 Khalilzad described his meetings in Doha as "more productive than they have been in the past" and added that the two sides had made "significant progress on vital issues." He did not elaborate and said the talks would resume shortly. Late Saturday, U.S. Secretary of State Mike Pompeo said in a tweet, "Encouraging news from @US4AfghanPeace (Khalilzad). He reports significant progress in talks with the Taliban on #Afghanistan reconciliation." He added later, "The U.S. is serious about pursuing peace, preventing #Afghanistan from continuing to be a space for international terrorism & bringing forces home. Working with the Afghan gov't & all interested parties, the U.S. seeks to strengthen Afghan sovereignty, independence & prosperity." Shortly after Khalilzad's tweets, the Taliban issued their own statement, saying the negotiations "revolving around the withdrawal of foreign troops from Afghanistan and other vital issues saw progress." "The policy of the Islamic Emirate [the Taliban] during talks was very clear — until the issue of withdrawal of foreign forces from Afghanistan is agreed upon, progress in other issues is impossible," the group noted. But the issues under consideration are of "critical nature and needed comprehensive discussions," the group said. The Taliban added that the two sides would share details of the Doha meetings and receive guidance from their "respective leaderships" before they reconvened to discuss "unsolved" matters to find an "appropriate and effective solution." The Taliban statement did not explain further. Sources told VOA they believed the agreement on a conditional and limited withdrawal and cease-fire would give both sides an opportunity to test the waters "without taking too huge a political risk." "Pakistan's success is that it has sincerely and faithfully diverted the recent positive environment and energy in its relations with the U.S. to the complete benefit of the Afghan peace process, and Afghanistan as a whole," a senior official told VOA as the talks progressed in Doha. Islamabad insists a peaceful Afghanistan is key to Pakistan's future security and economic stability as well as those of the region in general. Pakistani officials believe any agreement at this stage will help bridge the trust gap between the U.S. and the Taliban and will "add much needed political capital" to Washington's account to achieve the ultimate goal of peace in Afghanistan. This agreement may prove an important asset in later, more serious stages of negotiations, they said. Pakistani Prime Minister Imran Khan's nascent government, which has made resolution of the Afghan conflict its top foreign policy priority, sees continued U.S. involvement in Afghanistan reconstruction as key to the future security and economic stability of the region. "This political reconciliation must succeed. ... We wish that the U.S. leaves Afghanistan as friend of the region, not as a failure," Pakistan army spokesman Maj. Gen. Asif Ghafoor stated prior to the Doha talks. Afghan President Ashraf Ghani, listens during a press conference with NATO Secretary General Jens Stoltenberg, at the presidential palace, in Kabul, Afghanistan, Nov. 6, 2018. It is not clear whether the Taliban have agreed to talk directly with President Ashraf Ghani's national unity government in Afghanistan, an administration that critics say remains fragile, is marred with political controversies and suffers from "disunity." The Taliban have so far refused to engage with the Afghan government in a peace process, dismissing it as an illegitimate entity and an "American puppet." "There's discussion, but this discussion needs to be shared back. A discussion that does not involve the region, we will not trust," Ghani said when asked whether the talks in Qatar were nearing a breakthrough. "If we don't get all the pieces right, one piece alone doesn't suffice," he added.